Home » Blog » Balance the Body » Weight Loss » Is A No Breakfast Regime Actually Better For Your Health? In today’s article I will introduce you to the idea of implementing a no breakfast regime into your lifestyle and if this approach is actually better for your health. For many years as the owner of a chain of gyms and fitness instructor I preached the message that you must “Eat breakfast like a king, lunch like a prince, and dinner like a pauper.” Hands up I have come to understand this is wrong. I have learnt that there are many benefits of having a no breakfast regime. In fact, skipping breakfast is advantageous for both your health and your weight. Whether we are talking about starting the day with bacon, sausages, eggs, fried potatoes, tomatoes, mushrooms and toast or porridge oats with berries it can prove incredibly beneficial to forego eating breakfast entirely. We have been conditioned to eat breakfast whether we are hungry or not. 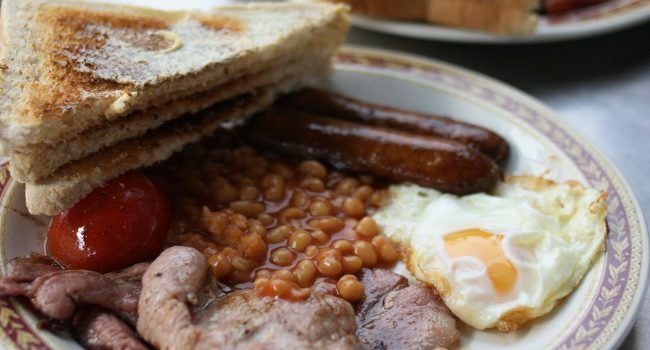 Too often we load up on heavy breakfasts with sausage, bacon, eggs, bake beans, tomato, has browns, toast and butter. Even continental breakfasts come laden with sugar in the sugared doughnuts and pastries. Instead of refueling at the beginning of the day, with or without healthy choices, allow your body to be free to burn stored fat for energy and follow a no breakfast regime. The body has been at rest all night. It has not expended energy, so why should a person get up after the inactivity of sleep and put a big breakfast into the stomach? After all the effect of a big breakfast is to drain most people of the precious energy gathered by the recharging night’s sleep. They feel weighed down, filled up and lethargic before the day has even begun. People have been told, “Breakfast is the most important meal of the day. It gives you the strength, the energy and the vitality to do a hard morning’s work, either physically or mentally.” This is absolutely erroneous! It is not a true scientific fact. It takes hours for your breakfast to be processed by the digestive system before you can gain any energy or vitality from a big breakfast. Digestion is a most highly complicated process. Every item of food in the breakfast has to be broken down into fine nutrient fragments so that the cells of the body are fed. By missing breakfast you are going your body additional time to masticate, digest, assimilate and eliminate food’s already in your system instead of burdening your body within a short time of waking up. It is far better to leverage your natural overnight fast by skipping breakfast but drinking water and black coffee makes this easier. I refer you to a recent blog article I wrote introducing you to intermittent fasting ‘How to do an Intermittent Fasting Diet’. You fast while at sleep. Fasting puts the body in a condition where it can turn its attention to flushing out literally all the crap in your bodies. Allowing our bodies to have a prolonged period of Fasting gives your overworked and overburdened internal organs ample rest and time for rehabilitation and permits them to become 100% efficient in healing themselves, flushing out the toxic poisons and the retained wastes that it was unable to break down and remove in the feeding state. ‘For more than ten thousand years fasting has been utilized to heal the sick. For nearly three years I relied on the power of medicine to cure my long term illness but nothing seemed to change in fact they got worse. I was desperate and after a conversation in the gym where a friend mentioned he was doing a 16/8 intermittent fast and felt like he had had tremendous results with weight loss increased energy and in fact felt 20 years younger. Having spent a great deal of time getting nowhere and staying unwell I decided I had nothing to lose and tried it myself. All it really entails is going without breakfast, and introducing a no breakfast regime. Sleeping for 8 hours not eating for the last 4 hours of your night and 4 hours of the next morning means you fast for 16 hours. You feed for the remaining 8 hours in the day. So as an example you begin the fast at 7pm go to bed at 11pm sleep 8 hours till 7 then eat at 11am. Once you overcome the small mental hurdles in the first few days of the diet, your body and mind simply gets used to not eating until around lunchtime. The first few days without breakfast will be difficult for you. Not because you need this meal but you’re used to eating it. Often you have it despite thinking I’m not even hungry. But there is a chance you’ll feel a bit of hunger and low energy and other symptoms. As time goes by, it will get easier and easier. If you think ‘yes’ then drink water, and in a few minutes you should feel fine. The improvement in my own case was so instant and so marked that I am now advise anyone to try intermittent fasting and to implement a no breakfast regime. A little starvation can really do more for the average sick man than can the best of medicines and the best doctors. I do not mean a restricted diet: I mean total abstinence from food. I’d love to hear from you …. please leave a comment below. Let me know if you’ve found this information useful and if you’re going to use it. Are you fed up of thinking there is no way out of your current ill health situation and need to find a solution to overcoming ill health? Join forces with me and together lets take back your health with my take back your health coaching.